ONE MORE COLD SOUP BEFORE FALL ARRIVES...! I have been eating a lot of cold soups recently and want to share another before fall sets in later this week. My husband, Jerry and I actually just had this soup for lunch. We ate it warm because it smelled so delicious we couldn't wait for it to chill down. It was wonderful warm with a sour cream garnish. I will chill it overnight and let you know if we like it better cold or hot. Or better yet, after you make it, please let me know your preference! This attractive soup only has a few ingredients and if you already have chicken stock on hand is very easy to put together. Garnish: About 1/2 cup sour cream mixed with 1 Tbsp. of water. I did not have time to garnish with additional beets, but think adding some thinly sliced cooked beets would enhance the look and taste of this delicious bisque. 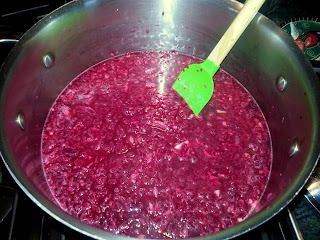 Or possibly add some tiny beet greens, making a salad-effect on top. In a food processor fitted with the shredding disk, shred the beets and apples. The reason for doing this is to get them a uniform size so they cook evenly. You can also use a box grater, but the food processor makes this very simple. In a large soup pot, heat the olive oil, a little salt and add onion and garlic. Cook over medium heat, stirring occasionally until softened, about 3 minutes. Do this while you are chopping the beets and apples. 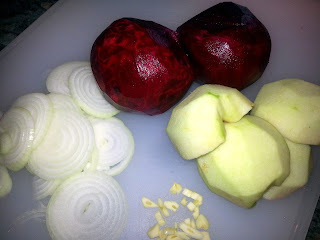 Add the shredded beets and apples and cook another 5 minutes. Add stock, water, and bring to a boil. 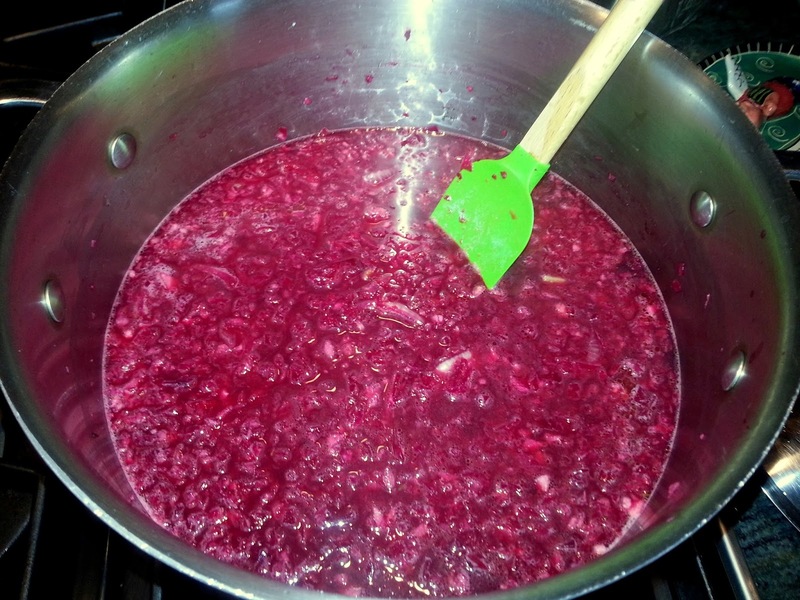 Reduce heat to simmer, cover and cook for another 30 minutes until beets are very soft. Taste and season with salt and pepper. Let cool slightly. 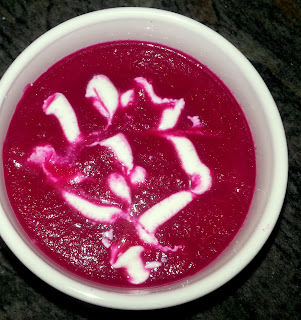 Puree the soup in a blender until very smooth. If you can't resist, like us, eat right away. Otherwise, put into a container and chill in fridge for a few hours or overnight. Garnish and serve. 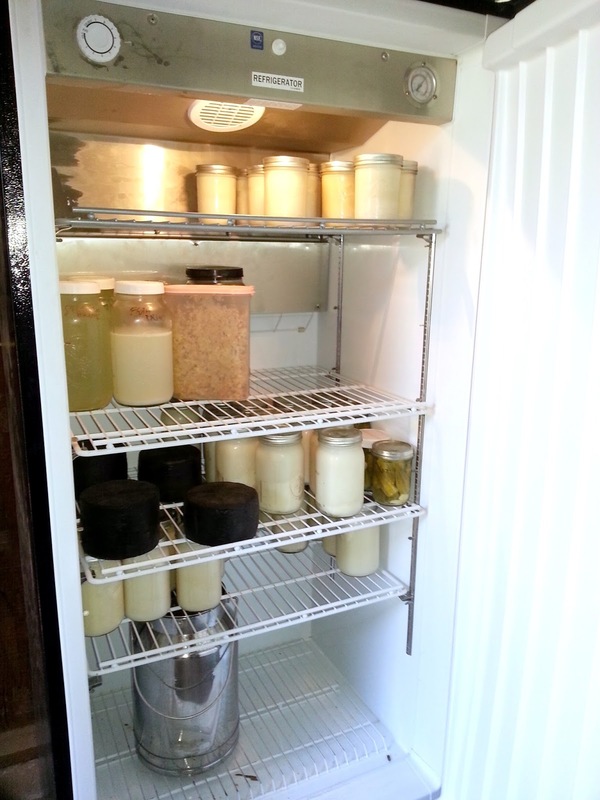 I have wanted to make cheese for a long time. Recently I met a delightful woman who lives with 13 goats on a remote ranch in south eastern Arizona. 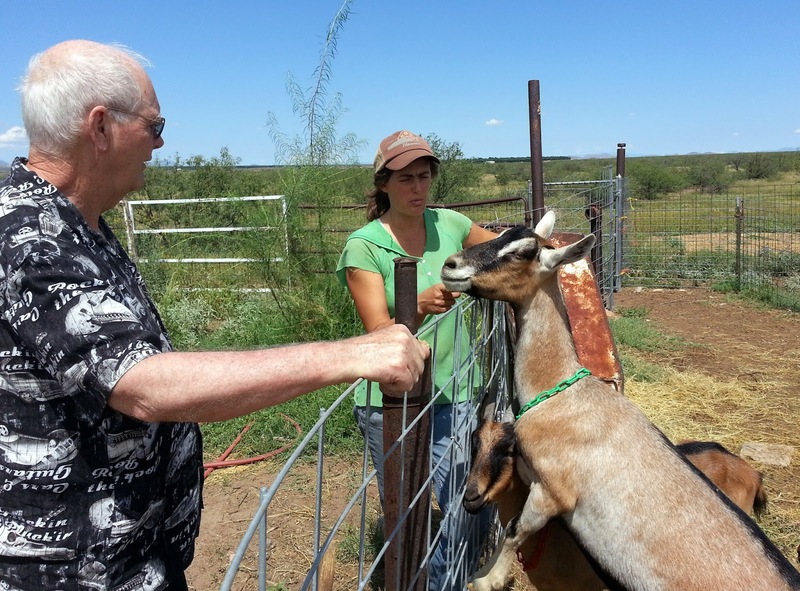 Anastasia's passion for growing organic, sustainable food is infectious and she generously shared her enthusiasm by spending a couple hours talking with Jerry and me about her life on the ranch. 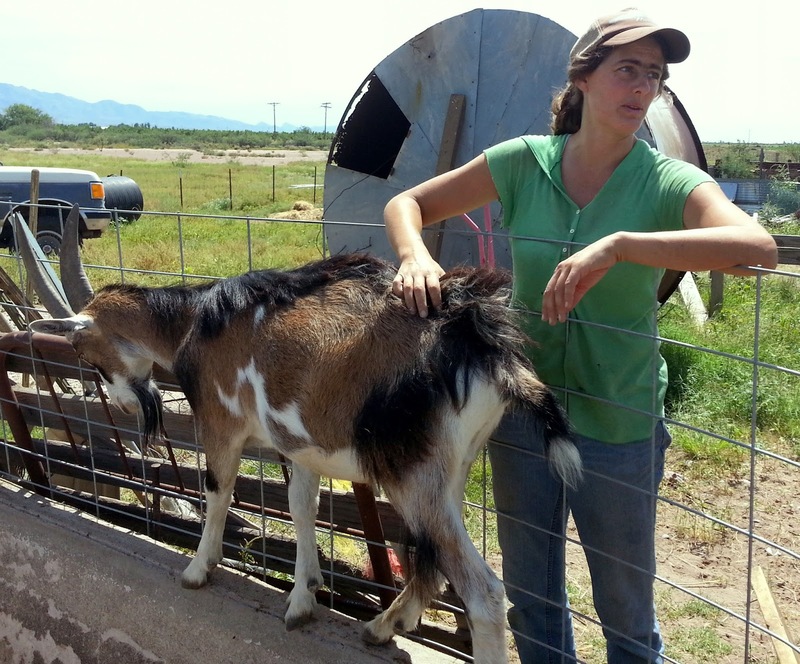 She also is a fabulous cheese maker and shared some goats milk (milked fresh that morning!) along with some tips on making my first ever cheese. cucumbers (from her garden), black olives and home-made mayonnaise. 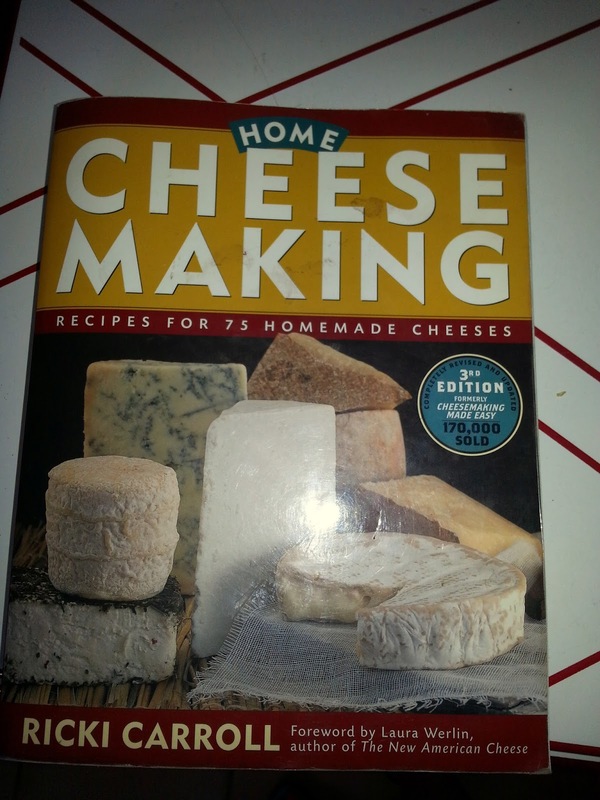 It turns out I already had the book Anastasia recommended on learning cheese making, as I have been reading about this craft for years. 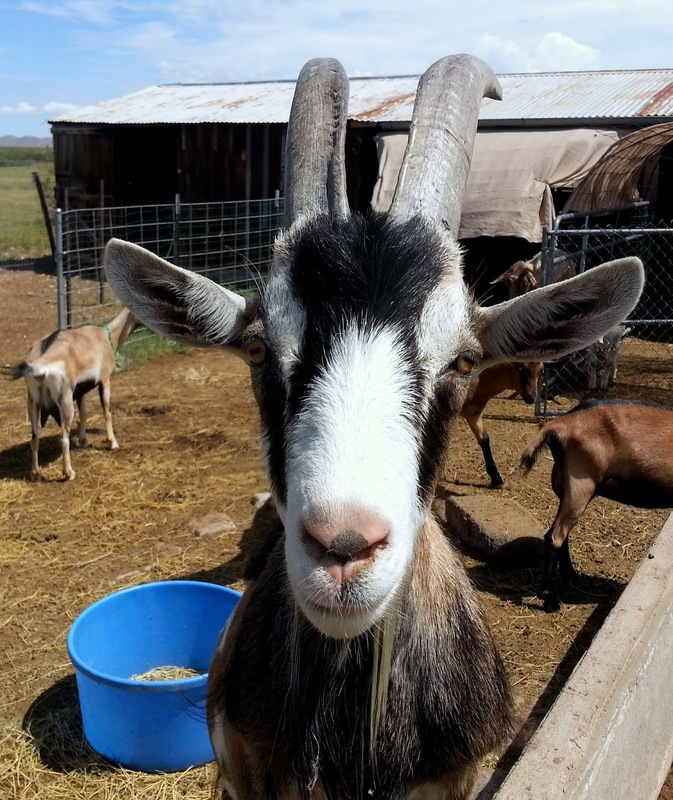 According to Anastasia, Ricki Carroll is THE authority on cheese making. Her company, New England Cheese Making Supply Company (http://www.cheesemaking.com/) is coincidentally based in Massachusetts, not far from where I used to live. ...to fridge! What a beautiful site! 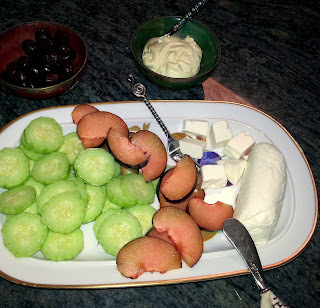 I made a soft goat's cheese called Chevre, which is the French word for goat. I had a gallon of fresh goat's milk, but my husband drank so much of it I ended making a half batch. I will give you Ricki's recipe for the full gallon. Pour the raw milk into a stainless steel or glass pot (do not use aluminum) and place the pot into another, larger pot containing hot water. Put the double boiler on the stove top. 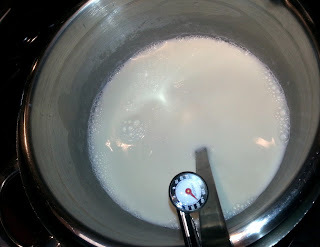 Heat the milk to 145 degrees, stirring occasionally to ensure even heating. Hold the temperature at 145 degrees for exactly 30 minutes. The temperature and time are important. Too little heat or too short a holding time may not destroy all the pathogens. Too much heat or too long a holding time can destroy the milk protein and result in a curd that is too soft for cheese making. Remove the pot of milk from the pot of hot water and put it into a sink filled with ice water that is at the same level as the milk. Stir constantly until the temp drops to 40 degrees. Rapid cooling is important to eliminate conditions that support the growth of unwanted bacteria. Yikes! The last thing I wanted to do was poison someone with my first batch of cheese! I followed these instructions to the letter. I covered the now pasteurized goat's milk with plastic wrap and kept in the refrigerator until I was ready to start the cheese. Heat the milk to 86 degrees. Add the starter, stirring to combine. Cover and let set at a room temperature not below 72 degrees for 12 hours. Ricki suggests making the cheese at night so you can drain it when you get up in the morning. Line a colander with butter muslin. I used cheesecloth...get it?! Seriously, either/or is fine. Cheesecloth is more coarse and generally used for firmer cheeses, but I did not have any butter muslin on hand and the cheesecloth worked fine. 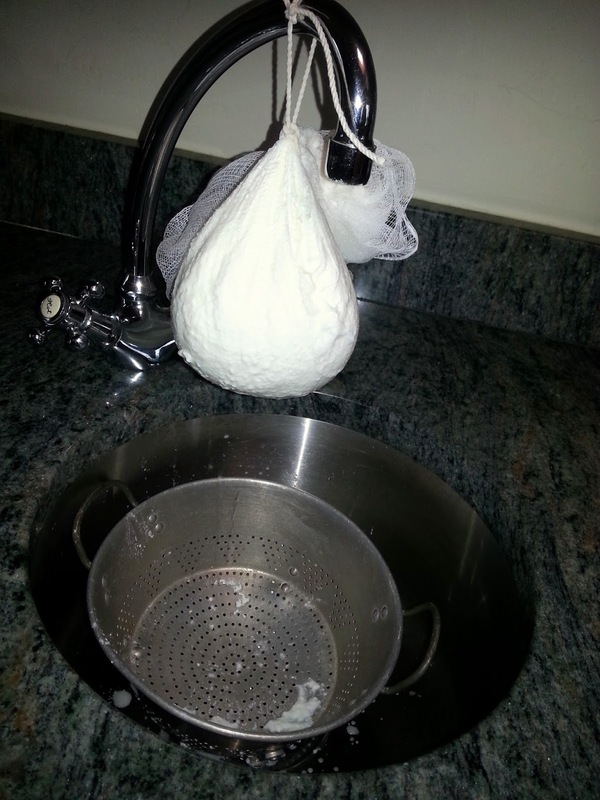 Tie the corners of the muslin into a knot and hang the bag over the sink to drain for 6-12 hours, or until the curds reach the desired consistency. Per Ricki, a shorter draining time produces a cheese spread; a longer draining time produces a cream cheese-type consistency. A room temp of at least 72 degrees will encourage proper draining. I let my cheese hang for about 18 hours as I wanted to be able to roll it into a little log. It was creamy and tasted so fresh...much different from what you buy in the store. 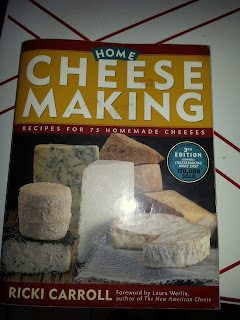 I am looking forward to perfecting my technique and making many other cheeses. Here is Anastasia with one of her "kids". Let me know if you want to get in touch with Anastasia. She has so much to offer and her life choices are truly inspiring to me! Another interest of mine is making sausage and earlier this year I had that opportunity. Next time I will share the details of my first sausage making adventure! learning new techniques...fulfilling my desire to live a more healthful, satisfying and sustainable life. And most importantly, having FUN in the kitchen! My husband, Jerry with Anastasia and a very inquisitive goat!